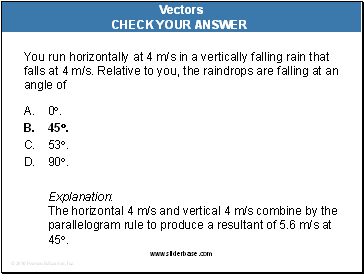 Explanation: The horizontal 4 m/s and vertical 4 m/s combine by the parallelogram rule to produce a resultant of 5.6 m/s at 45. Nellie Newton hangs from a rope as shown. 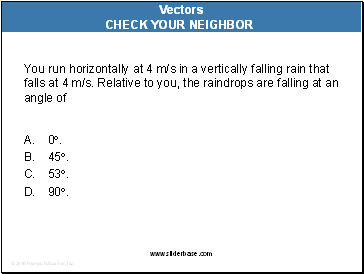 Which side has the greater tension? and a tension in the right-hand side of the rope. Because of the different angles, different rope tensions will occur in each side. 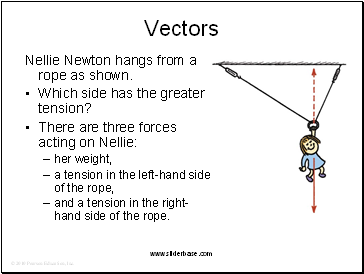 Nellie hangs in equilibrium, so her weight is supported by two rope tensions, adding vectorially to be equal and opposite to her weight. 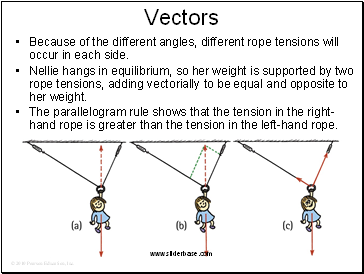 The parallelogram rule shows that the tension in the right-hand rope is greater than the tension in the left-hand rope.